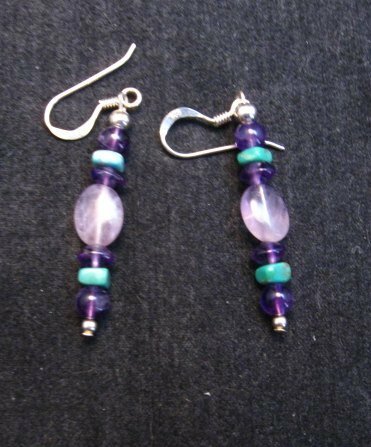 Natural Kingman turquoise and sugilite bead earrings with sterling silver beads and ear-wires created by Everett & Mary Teller. 1-1/8 inch long not counting the ear-wires. Weigh 1.2 grams each. Brand new and in excellent condition! Gift box and Authenticity Card included. Purchased directly from the artists. Check our other listings for natural bead bracelets, created by the same artists. 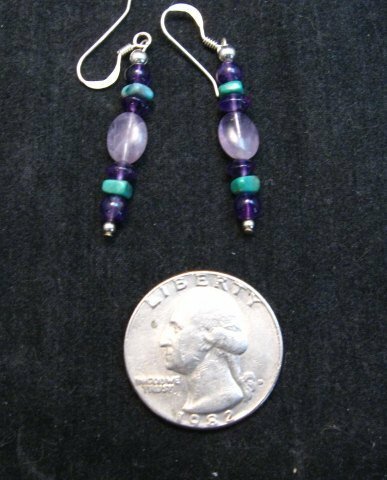 About Everett & Mary Teller: These self-taught silversmiths have been making jewelry since 1988. They carefully design their pieces and select the stones using a wide variety of natural stones -Turquoise, Lapis, Oyster Shell, Coral, Onyx and more.